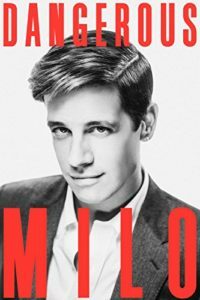 I bought this book on principle because I wanted to support Milo, especially after Simon and Schuster pulled it from Amazon after the latest manufactured outrage proved too much for their tender corporate feelings. (And before you ask, yes, I’ve seen the infamous interview that precipitated the breach of contract from S&S. Considering this is the same company that published Lena Dunham, color me unimpressed.) Be that as it may, I forked over the big bucks for the hard cover, or rather had my husband pre-order it for me for our wedding anniversary, with the full expectation of having it in my book case as a conversation piece and not much more. After all, having gotten into the habit of listening to Milo’s broadcasts on Youtube while doing housework, I was very familiar with his views and could probably repeat most of his jokes verbatim. Unlike most nonfiction from popular commentators, however, Dangerous is not simply a “best of” collection from previous speeches and blog posts. It’s a combination of a personal manifesto and solid cultural analysis, complete with references and statistics, and it flows seamlessly from hilariously irreverent to deadly serious. Much as I enjoyed this book, I wish Milo would consider writing fiction because oh my does he have a way with words. Dangerous is divided into three parts. The first (Foreword, Preamble and Prologue) is an introduction to who Milo is, what he does, and why so many consider him dangerous. Prone as he is to exaggerations, the claim is absolutely true. Mention his name in mixed company and you’re likely to encounter an equivalent of the Kingsman finale minus the pretty fireworks. This goes beyond identity politics, which insists on putting people in neat little boxes and proceeds to predict everything from the food they should eat to books they should read to politicians and causes they support. In addition to being impossible to classify, Milo is also immune to social and peer pressure. The fools who rejoiced at him resigning from Breitbart (where he already had essentially free hand) didn’t realize that he would become even more unstoppable with private funding and self-made platform. This is one scalp not up for the taking by Social Justice Brigades, and it has to drive them insane. Some on this list hate because they should be able to control him and claim him as one of their own, but can’t. Some because he is the only one pointing out the unspeakable truths in a way that’s actually accessible, therefore reaching the audience most others can’t. Some because he’s a direct threat to their comfort and power. It’s a mix-and-match kind of thing with a lot of overlap. He does not hate all of the groups back, by the way, cutting some of them more slack than I would do personally, but the nuance is not reciprocated by the other side. No matter. The haters don’t win, and their attempts only result in getting him more followers and better hair products. These chapters are useful not just as a recap of Milo’s detractors, but also provide a refresher on the history and current state of each group, and whether or not there’s hope that one or some of them would ever turn towards the light, so to speak. He has surprising amount of respect for intellectuals, considering how vocally he had been denounced by nearly every Conservative pundit. And, as he points out at the end of the Establishment Republicans chapter, “No movement has ever survived with just moderates and intellectual, and no movement has ever survived with just hellraisers. If we want to win, we need both.” To which I say, Amen. In spite of the current frictions, the two sides of the pro-freedom coin need not be at odds. There are two additional chapters dedicated to the folks who DON’T hate him: Gamergate and college kids who love free speech. If you’re still unfamiliar with Gamergate, this chapter provides and excellent summary. And apparently we have Allum Bokhari of Breitbart to thank (or blame) for kickstarting Milo’s career by sending him information on Gamergate. Or should we more accurately thank Zoe Quinn? Well, you get the idea. The chapter on college tours gives me hope. The protesters and general therapy-dog-demanding whiners get all the attention, but Milo would not BE doing college tours to begin with if there weren’t large groups of students eager to see and support him. Perhaps there’s no need to be overly down on the new generation after all. There’s a lot of free thought and bravery to be found among the current crop of college students, and they could very well fix the world we of the Gen X allowed so carelessly to slide in the wrong direction. The third pard, Epilogue, has a title I will leave for you to discover. Suffice it to say, it’s essentially a call to action, and a guide on how to be successful if you want to try your luck as a Milo-style Culture Warrior. While there’s only one Milo, the field is wide open for ambitious copycats. Astounding Frontiers #2 –Pulp Revolution Meets Superversive!